Preheat oven to 350 degrees F. Line a cupcake pan with paper liners and set aside. In a large mixing bowl, mix the flour, baking powder, baking soda, and salt. Set aside. In a separate mixing bowl, stir the melted butter and sugar together. Chill for 1 minute. Add the egg, yogurt, milk, and vanilla extract to the first bowl. Mix well. Stir in the butter and sugar mixture. Divide into cupcake liners, filling about 2/3 of the way. Bake for 15-20 minutes until cupcakes are golden brown on top and toothpick comes out clean. Cool 15-20 minutes, frost & enjoy! Yield: 12-15 cupcakes. Thus, I usually double this recipe- who only wants 12 delicious cupcakes?! I use non pareil sprinkles, as the colors bleed less. If you choose to use non pareil sprinkles (the little balls) be very careful folding the sprinkles in and try to stir the batter as little as possible. The batter may be slightly lumpy, that is OK! Make sure to let the cupcakes cool completely, or your frosting will melt! haha I totally tried to make a funfetti cake for one of the kids I take care of. I failed miserably because I used the wrong kind of sprinkles and all the color ran off and turned the cake a kind of brown color. Yours look pretty good! Marianne, I am guessing you used nonpareil sprinkles, which do tend to run. Try another kind and I bet it will go great for you! YUM! My daughter is obsessed with everything funfetti- cake, cupcakes, ice cream, homemade chex mix- you name it. I cannot wait to try your recipe for her! I hate all the articifial ingredients in the traditional funfetti mix and am excited to still give her her fav without all the yuckiness. Thanks so much! Ashley, you will have to let me know how it turns out! 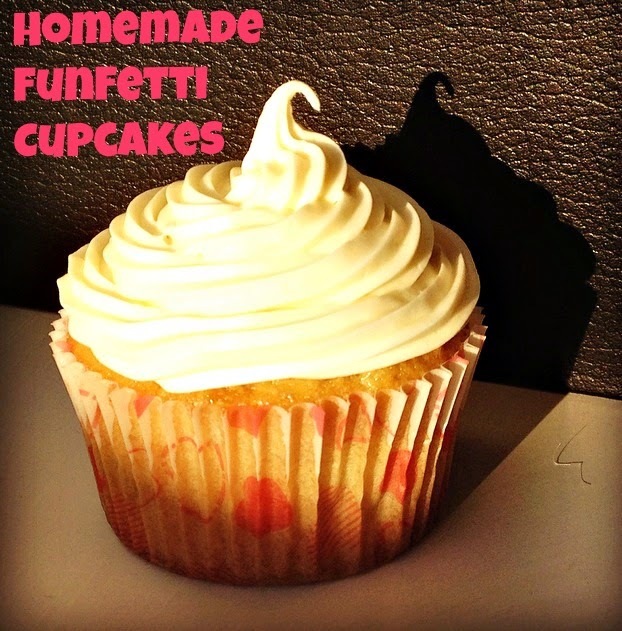 I've been loving these cupcakes ever since I found the perfect recipe, and have made so many batches. Oh this is genius!! Here's as close as I could find in Sweden: http://www.usagodis.se/betty-crocker-funfetti-angel-cake-lip-balm-1 Haha! Though, a request if I could? Might you include a picture of all the stuff you used? (And metric amounts, if you originally used them?) I'm really bad at trying to figure out which cream or something I should be getting at ICA and that kind of stuff because I knew more names for them in Swedish than I do English at this point. I never cooked/baked anything in the US and now do constantly! But man, it's torture trying to figure out all the Swedish equivalents for everything sometimes. Jamie, I just went through and updated the recipe with all of the metric amounts and Swedish names for ya! The next time I bake them I will work on getting a picture of all the ingredients. I feel you on the baking struggle- it is so difficult! If I remember write, The Local has several "American" forums and they have helped me out so much before! i.e., with discovering baking soda is bikarbonat. Most Swedes just use bakpulver! Oh, you're awesome!!! I've looked through their forums too, but man, it seems like there's always 5 different suggestions for each thing. Thank you so much! I would say its never too early to want cupcakes! You'll have to let me know how yours turn out! I actually used to want to make cupcakes for a living...then I transitioned into the world of cakepops and had a good business going for a while. I stopped because blogging actually took over my time, but I still love the art of baking...makes me want to start kind of baking again. Kiwi, how cool that would be! I only bake for fun. Isn't it amazing how much time blogging takes up? I LOVE funfetti cupcakes! Next to pound cake, they're my favorite type of cake because sprinkles make everything better. :) I've never tried making them from scratch but these don't look too hard, so I might have to give them a try! Natalie, that is how I felt- sprinkles make everything better. I'm so glad I found this recipe! My kids love Funfetti cake mix!! I love the idea of making my own cake mix instead of buying it at the store. I never would have thought that Funfetti cake mix wouldn’t be in other countries, my kids would be bummed. Jennifer, that is why I had to find a recipe on my own. Truthfully, I think these are even better than the Funfetti mix! Wow your cupcakes look amazing! I really love that you used yogurt in this, it makes it a bit healthier! I love baking and will definitely be checking this out soon. Thanks for the great recipe and final product photo. It makes me really want it right now! Michelle, the yogurt really helps to keep the cupcakes moist. So delicious! Alysia, the yogurt definitely helps to keep the cupcakes nice and moist. And I definitely have lighting challenges- right now, Sweden only has about 4 hours of sunlight a day, and only 2 of those really give my apartment good lighting. So I am always on a time crunch for pictures! These look so sweet and delicious, I especially love the look of the frosting. I would have never have thought of adding yogurt to cupcakes, I have to try that. I love making cupcakes so I have to have a go at making these. I'm loving the funfetti name, so cool! Fiona, the yogurt really helps to keep the cupcakes nice and moist. I read about that somewhere and knew I had to try it out! Oddly enough, I don't ever recall having a funfetti cake. However, these cupcakes looks so good and it is one of my favs. I love me some cake. Thanks for the recipe. I'll read up on what funfetti is share it with my readers. Thanks. Ohh, funfetti is so good! It is a type of boxed cake/cupcake made by Pilsbury (I believe) and so this is just a homemade version! Those are really nice cupcakes with minimal decors but look appetizing all the same. The frosting always wins me over. When baking, do you use any silicone mat before putting the sheet into the oven? I haven't used any silicone mats (yet) but it is something I have looked into! Have you found specific benefits from them? I've never heard of these ... they sound so cool. I have to say, though, I was really hoping to see a picture of the inside of one! I will be visiting my grandkids soon so I will add this to my list of "must-dos"! Cherri, next time I make a batch I will get a picture of the inside! It is so hard to stop eating them once you start though…probably why I don't have any 'inside' pictures yet! Ashley, you definitely should- so delicious! These were amazing! My whole family enjoyed them.